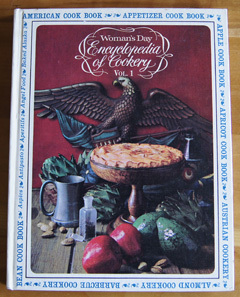 Cookbook #9: Woman’s Day Encyclopedia of Cookery, Vol. 1, A-Bea. Woman’s Day, Fawcett Publications, NY, 1966. This is the first in a series of 12 food encyclopedia volumes. They were my mother’s, so I will not part with them. But that’s not the sole reason that I now want to keep them. Printed encyclopedias. Outdated tools? Today my first impulse when I have a question about (for instance) different types of apples, I open a web browser and enter my search terms. A plethora of links appears almost instantly, and I quickly scan the information that random people have uploaded to the internet. I have a (probably correct) answer, and then I jump to another website, or another task. That tidbit of information was fleeting. I probably will never see it again. The web gives us quick answers, but we miss something, we miss the permanence of the written page. Print-published authors take a lot of time gathering their information, checking their facts, editing the text, polishing their photos. The next time I open this particular encyclopedia, the same information will be there, in my hands. And when I took some time with this encyclopedia, which by definition gives “information on many subjects”, I found it full of not only information, but unexpected treats. Let’s start with abalone, the first entry. This mollusk is described, including availability, calorie content, and basic preparation. Then several recipes are listed. This is the basic layout throughout the volume. Some information is dated, e.g., for abalone: “In the US, the fresh shellfish is limited to California. The law prohibits its shipment fresh to other parts of the country.” Interesting! It’s no longer true, but years ago, you could only have fresh abalone in California. The next entry is acorn squash, again with description and recipes. I learned that aioli is a thick sauce flavored with garlic. Definitions of the cooking terms “a la carte” and “a la grecque” and “a la king” are given, along with related recipes. Then I came to a section titled “American Cooks are Good Cooks”. This section takes up a full third of the volume! I began reading the three page introduction to this section, written by a woman named Sophie Kerr. I’m sharing a few parts of this article so you, too, can enjoy it. Screamed like Indians! Boy, no one would write that today. Enchanting. Sophie Kerr’s essay is followed by a collection of recipes from all fifty states. None of them caught my eye to try—Denver Sandwiches, Squaw Corn, Campfire Trout, Topeka Fried Chicken, Iowa Farm Ice Cream—but it’s interesting reading and has lots of photos. In fact, the entire volume is illustrated with full- and half-page photos, as well as drawings and decorative page borders. I am going to remember this encyclopedia the next time I want to look up information about a particular food item or term. I know I’ll not only find the information I need, but also a history lesson, and maybe a chuckle or two. It’s an excellent source of historical recipes from the first half of the twentieth century in the US. However, I don’t find the cookbook very useful when searching for a recipe, because of the organization. 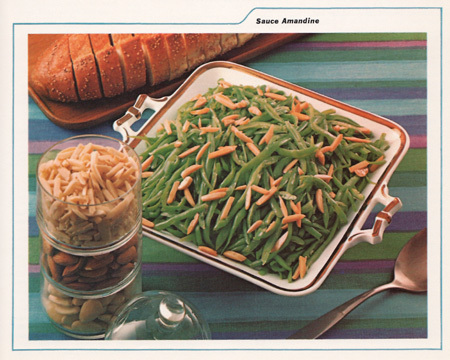 Who would think to look for a recipe for green beans in the “A” section, under “Sauce Amandine”, in the almond section? (In the encyclopedia’s defense, though, a detailed index at the back of the last volume helps.) Another drawback is that the recipes were written before the invention of modern kitchen conveniences: immersion blenders, food processors, and microwave ovens to name a few. I decided to cook a recipe from the “Apple” section. I chose Apple Butter. Why? Well, as often happens, what I cook is determined by what needs to be used in my freezer or on my shelves. A couple months ago we were leaving for vacation and I had a lot of apples that wouldn’t keep until our return. So I cored them and cut them in chunks and froze them, thinking I’d make applesauce someday. Combined with a few aging apples on my counter, they would be great for apple butter. I modified the recipe from the Encyclopedia of Cookery (below) quite a bit. I wanted to use my slow cooker, and I didn’t want to strain the apple mixture. Instead, I chose to blend the cooked mixture, so that I could incorporate all the flavor and fiber of the apple skins. I added ginger and nutmeg because I like apple butter spicy. Consulting one of my crockpot books and a couple online recipes to determine cooking times, I came up with a more or less original recipe, entered below. 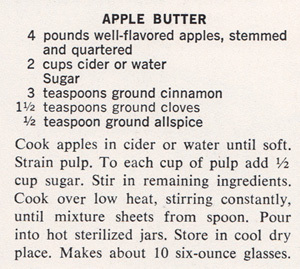 If possible, use a mixture of sweet and tart apples. This recipe makes 12 4-ounce jars. Combine all of the above ingredients (except the lemon) in a slow cooker. Cover and cook on low for about 10 hours. (This is convenient to do overnight.) At this point, you can let the mixture cool and process in batches in a food processor. Or, you can use an immersion blender to puree it right in the slow cooker. With the lid off, turn to temperature to high and cook for 1-3 hours, stopping when the apple butter is the thickness you prefer. And taste it, adding more spices if you like. I added the juice of half a lemon to lend it a little zip. It took 2 hours for my apple butter to come to the thick spreading consistency that I like. 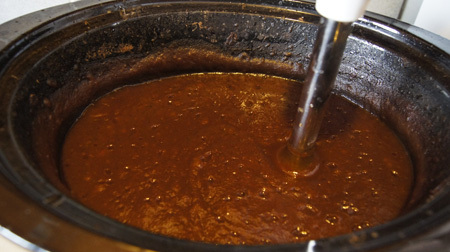 The apple butter will keep in your refrigerator for up to a month. I decided to can it in small 4 ounce jars to keep and to give away. 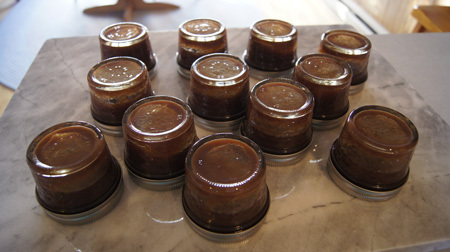 I sterilized 12 of these cute little jars in boiling water, then filled them with the hot apple butter. 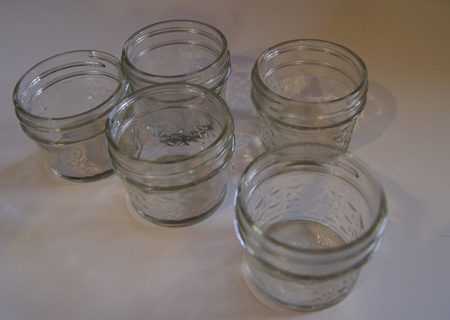 Then I closed them with hot canning lids and set them upside down on the counter to cool. The whole process took awhile and it really made the house smell like apples and cinnamon, especially during the overnight cook. It was all worth it! This apple butter turned out very good, and we are still enjoying it, on toast, peanut butter sandwiches, and sweet potato biscuits (cooked as per this recipe but with half the baking powder). This entry was posted in 250 Cookbooks, Jams and Butters, Slow Cooker by admin. Bookmark the permalink.